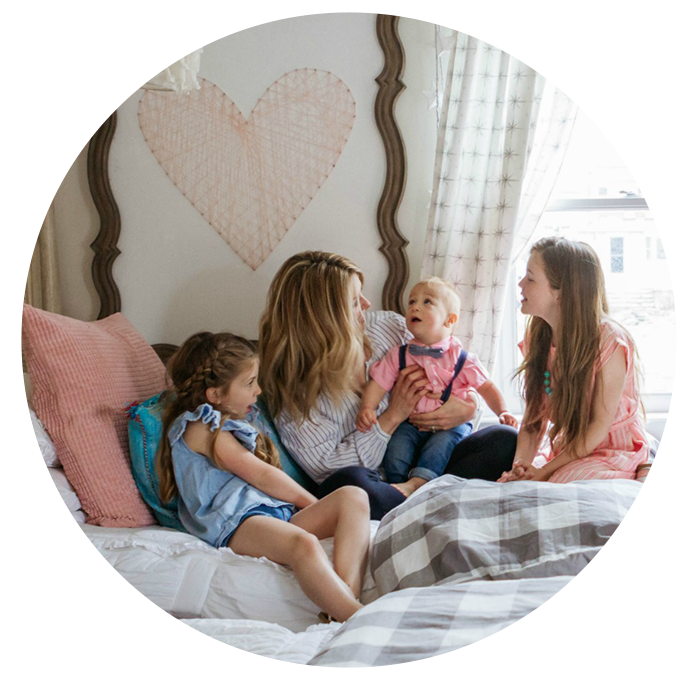 Yesterday on the blog I shared the design plan for this girls shared bedroom. Well, I got it done faster than I thought I would and get to share it today with you! 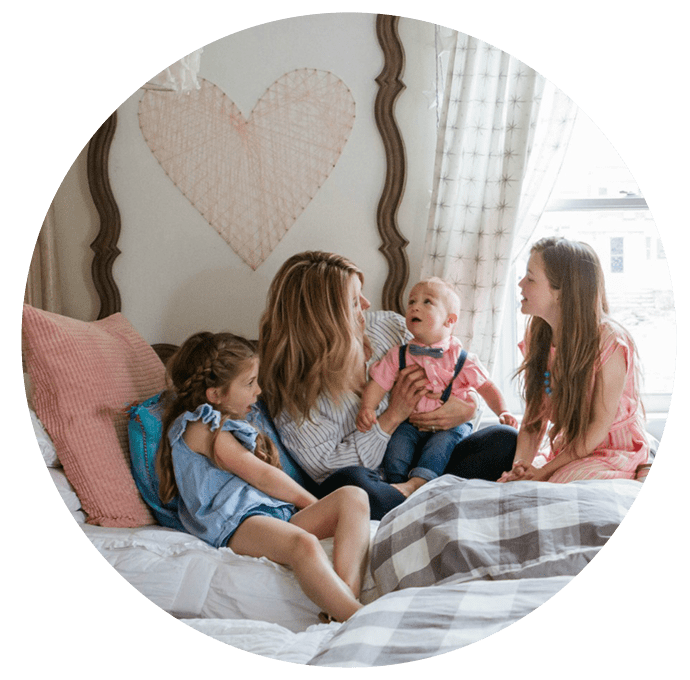 The home owners worked hard on painting the bedroom, setting up the bunk beds, painting the new/old dresser pink and getting the rest of their to-do list done! I went to their home yesterday and installed some wall decal’s on an accent wall and finished styling it all! It turned out so much better than I thought it would! Best of all Amy, (the homeowner) gasped when she walked in! She thought I had hand painted the flowers on the wall. I mean, that shows a lot of confidence in me! Wait until you see what $45 can do to a wall! Also the Husband of this house told me that I have given his wife so much, but mostly I have given her the idea that “less is more.” I was really surprised he said that, often I am told I add a lot to a room. After thinking about his comment I think it is more about keeping everything that goes into the room intentional and that is serves a purpose. I decorate with books they use, unique toys and even the plants have a job of circulating the air. Also I think it is important in smaller spaces to do the opposite of what you might think- larger pieces and less of them. This bedroom makeover has new decor from Walmart and also thrifted furniture. Making it a really affordable girls shared bedroom. Mixing old with new is really the only way to make a space look personal from the start. Let’s take a look at the bedroom before. I want you to REALLY look at it and look for the subtle changes that you can make to any room too! Biggest change on this wall was I switched out the window treatment to THESE bamboo shades from Walmart. I can’t say it enough. The right window treatments add so much to a room. We switched out both windows on this bedroom for about $80! The texture really cozies up the bedroom. I also added THESE sconces with magic lights to either side of the window. No electrician required! (See how we did it HERE). The darling little kids table and chairs are thrifted finds! See the other window peeking out behind the bunkbed. I will say this room was really tricky to photograph because of the two windows letting in different amounts of sun. But a big blessing to have two windows! The bamboo shades aren’t black-out they are light filtering. For kids that don’t nap in the day most of the time it isn’t a necessity they have blackout lining. We moved the oldest daughter into a different bedroom and the two twin girls into this room. Can you even handle these bunkbeds?? I can’t. They were the first thing I picked for the room from Walmart! Yes, Walmart! You can also change them from bunkbeds to single twin beds. The top bunk pieces become the footboards to the bottom bunk pieces that are the headboard. These beds can grow with these darling twin girls that sleep here. If you remember from yesterdays blog post the twin 6 year old girls were in their toddler beds. The toddler beds fit them just fine, but were on the verge of not working anymore. So that is what inspired this bedroom change. Getting the sweeties into some new beds that they can grow with. I added some extra pillows to the bottom bunk. I imagine them using the bottom bunk like a daybed- both girls and parents inside reading books at night. I also used the same zip-up bedding my girls have! It is perfect for kids and making a bed in 10 seconds and perfect every time! The rug is a new addition. If you look back at the rug before it was pink, which actually felt really dark in here. The room doesn’t get a ton of light. So selecting a lighter rug was important. Sometimes it isn’t always about what colors you love but about what the room needs to make it feel the way you want it to feel. And we wanted it to feel peaceful for the full of personalities 6 year old girls. You can find the rug HERE from Walmart online. How many packages did you order? I only used one package that came with two sheets of flowers! So it only cost $45 for this statement wall! Comes on two 24-in x 36-in sheet, contains 20 pieces (mixture of flower and stem). How did you decide where to put them? This is a great question. I originally ordered them to do on the wall where the beds are, as a main statement wall. But after seeing the beds installed realized they would be hidden. So I picked the wall that was the least busy but was a also a main wall. I considered the wall that you see right when you walk in the room, but that felt too busy. Hopefully that gives you somethings to consider. Can you use these decals on textured walls? Most wallpaper instructions will say no. But I know many of you who have used them on textured walls. These decals adhered really easily to the wall so I would say that yes you could try them on textured walls. Is this really “temporary” for a rental? While I was applying the decals I could easily pull them off the wall and move them around. I have heard that some decals get harder to remove after a year. But this type of decal said this- “Safe for walls: always removable and leaves no sticky residue”. Where can I buy them? You can order them online HERE and found THESE for a boys room. I used a lot of what they already had to style the bookcase. Everyday, useful objects are the best kind of decor. Having a “home” for everything makes life easier for kids! There is no guessing or wondering where things should go. Less chaos the better. We have two dressers in this bedroom. Both dressers were thrifted finds. The biggest dresser will actually hold some of their toys. And it was also FREE! Her hubby found it on the side of the road and took the drawers out of it to claim it then went back with a bigger vehicle to get it home! Get creative with your storage and don’t be afraid to let things go that you can’t find a “home” for. I had her paint it in Dream Whip from Benjamin Moore. It really completes the room! She used Benjamin Moore Advance Satin Paint. It took her two coats to get it perfect! Thank you for all your excitement over this post! Let me know anything I missed in the comments below. And if you are an email subscriber you got to see the sweetie girls enjoying their new big girl bedroom! They love it. You and the parents did a beautiful job. I can not believe the bunk beds are from Walmart. And I love that the dressers are a thrift find. It is absolutely lovely. Thank you for sharing. Oh, and I love the way you arranged the flowers. I love this room transformation!! It is so sweet. Thank you for sharing! Absolutely love this room! It was very nice before but this just works so well and feels more spacious, especially with the bunk beds and the softer colors. The decals really add a lot! Very inspiring. So pretty! Love how the decals turned out! I am absolutely in love with this transformation!!!!! Anxiously awaited the reveal, and you did not disappoint!!!!! Love the way between the homeowner & you as the designer showed us with any budget and some creativity we can creae a warm space in our home! What a beautiful transformation. I love the decals and how you placed them; going to try in my daughters room!! How often do you wash your son’s Beddy’s? Does it still hold up well after repeated washes? I was them every two weeks. And yes, they have held up so well!! I appreciate you leaving this comment. I really do try to share different price ranges and try to think outside of just what I would buy. I found you a few weeks ago and I think I am devoloping a slight addiction to your posts. The magic light has been a game changer! You really very inspiring! If you place a tin or pan of charcoal briquettes inside of any object and can possibly seal it say with drip cloth plastic sheets, dismantled large garbage bags in order to cover entire piece and leave it closed up for a couple of weeks. The charcoal will absorb any odor. This especially works well in automobiles as well to remove funky smells by placing under a seat, the trunk, etcetera. The important thing is to be able to seal it from the air. You can also do this with plastics. And then wipe down the insides with pure vanilla. Letting it sit a spell and then wipe clean. I learned all these “tricks” after going thru a house fire. Hope this helps! Amazing!!! Beautiful and well thought out Brooke!! This room is amazing. Great job. Love it all. Brooke! This is beautiful!!!!!!! will you show the other sister’s room when it’s done? i hope so, as this is too fun to miss. Yes! I just talked to her today and I will share her daughters room and her master bedroom too! Wow! This turned out beautifully. The reveal was worth the wait. You never disappoint. These are two lucky girls. love this! so inspiring to work on my little girl’s room! So beautiful!!! I’m wondering if you would recommend that rug for a dining room or not. I love the color and the accent fringe on it, but not sure it would work in a dining room. We have printed chairs so I need a neutral that isn’t boring though!! Thanks so much…so, so glad I found your blog and Instagram recently. I feel so inspired! Hi! I personally wouldn’t do the rug under a dining table….it’s pretty light! It looks amazing, Brooke! Love seeing your posts! You nailed this room…absolutely darling!! 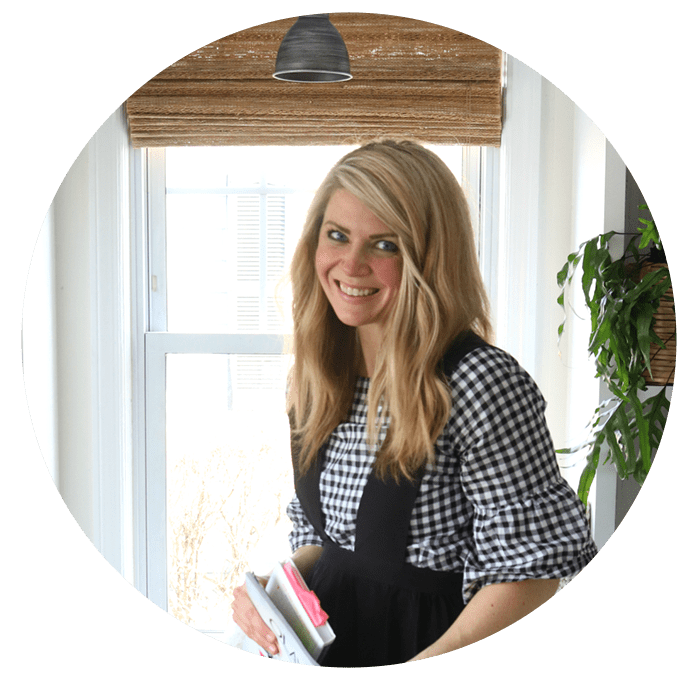 I admire your approach to decorating…practical but beautiful, budget friendly with a sparkle of splurges, and most importantly, in line with what your clients love not necessarily what is trending. You’re work is amazing! I loved looking over the pictures yesterday for this house. You are one of a kind. Always able to make a design look elegant, cozy, and functional. I don’t see anyone else on Instagram who styles as best I think you do. Thanks for all of the inspiration! I had no idea Walmart carries such beautiful furniture. Thank you for sharing this fun transformation. You rock girl! Beautiful room! Where is the gray and white pillow from on the bed with the animals and trees from? Oh that is really old! I actually made it from leftover fabric and gave it to her! Beautiful room Brook. Love how you used so many “rescued” thrift pieces – they always give so much more personality then everything new……not to mention the cost saving! Question – you mentioned zip bedding. I think it must be a bit like a sleeping bag. Where can you buy it? I live in Australia but have never seen or heard of them but would be very effective for young children. Oops! Never mind, I found it. Thanks!